The world was a bit simpler when I was a kid. I was brought up in Stafford, which is in the West Midlands. Which meant that the Midlands Electricity Board provided our electricity. and Stafford is in England which is a part of Britain and so, naturally, British Gas provided our gas. And British Telecom provided our telephone line. Simple. Of course that was in the days before such things were privatised. And it was before the internet and mobile telephones were a part of our everyday lives. Nowadays everyone seems to offer everything. 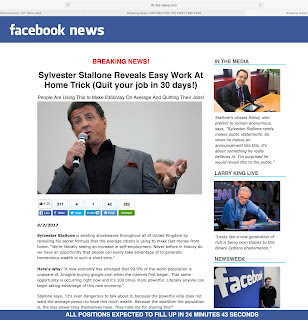 Sky TV don't just deliver satellite televison, they're internet service providers. British Gas provide electricity. Marks & Spencers provide gas. Tesco are a bank. And British Telecom are a TV sports channel, a satellite broadcaster, an internet service provider and a hawker of fraud. Admittedly that last one isn't something they do on purpose. But they do it. And - perhaps more to the point - even when they know they're doing it they seem unable to stop it happening. That's an ad for something called The Oxford Method. ... and if you saw the fourth series of Modern Life Is Goodish last year, it might be ringing a faint bell or two. Because last year, one of the episodes had a section about something called The Brit Method. And also the Aussie Method and the Canuck Method and the Irish Method and a whole lot more. The Brit Method is a a con that sells the idea that a man has found a foolproof way of investing in Binary Options; a special method that guarantees success and will make anyone a millionaire... and that is mysteriously being offered, for free, to a select few. All you have to do is invest some money. And then wait until you become rich. Unsurprisingly, there's no such thing as a foolproof way of making millions. People who fall for it will lose their money. 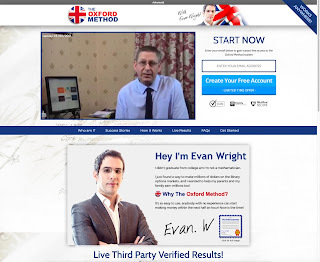 As you've no doubt twigged by now, The Oxford Method is just another Brit Method clone. 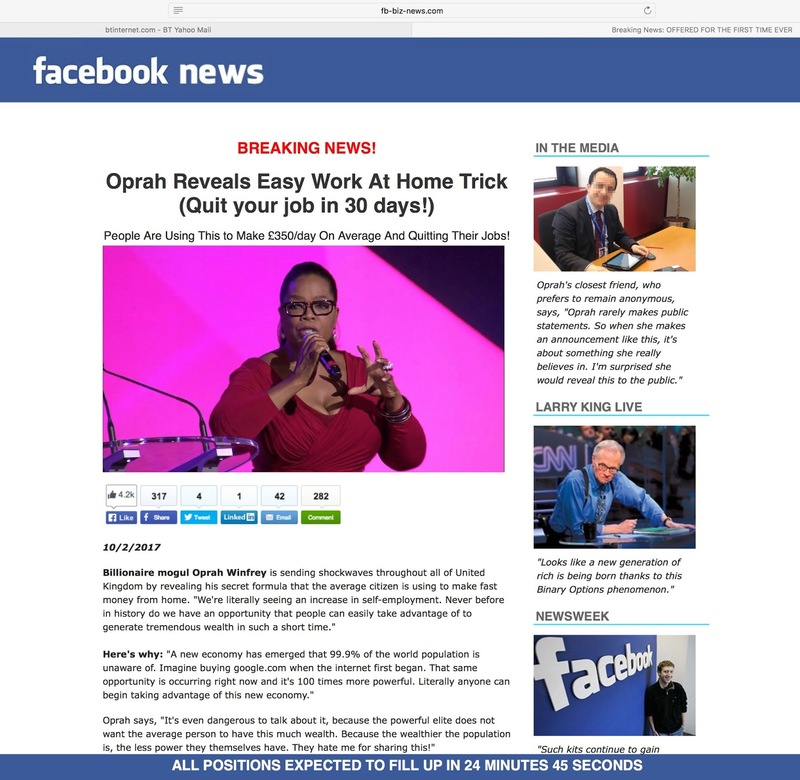 I'm used to seeing ads for dodgy offerings such as this on awful clickbait sites and in other dark corners of the internet but I was surprised to see it being advertised somewhere as mainstream as British Telecom's network. I might be wrong about this, but I reckon BT's history as a fundamental part of British life means they're likely to have an older client base than a lot of other internet providers. They're the trusted British brand that people have known all their lives. They represent 'the establishment' as much as is possible for a company in that business. I reckon a lot of people who find the internet a bit intimidating probably trust BT to deliver the service. If that is the case then I think it follows that BT's customers are more vulnerable to this kind of con. And I think the BT brand confers a touch of respectability on the ads they carry. 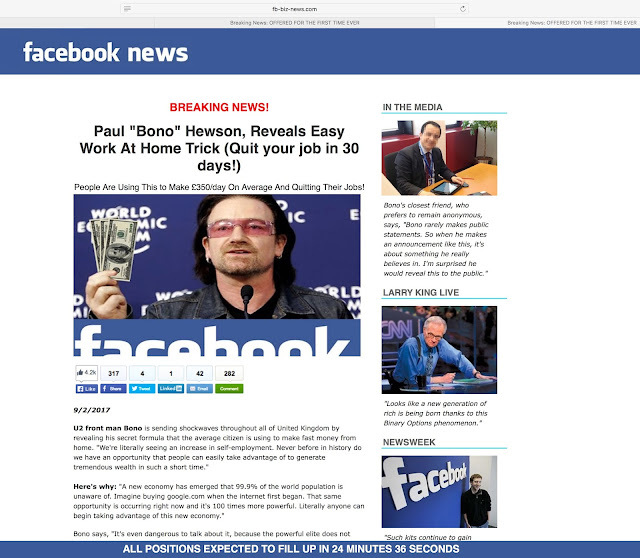 Doesn't an ad that appears as part of BT's branded content carry just a bit more authority than one that appears on one of those, "You won't believe what Susan Boyle looks like now" pieces of guff that so litter the information superhighway? 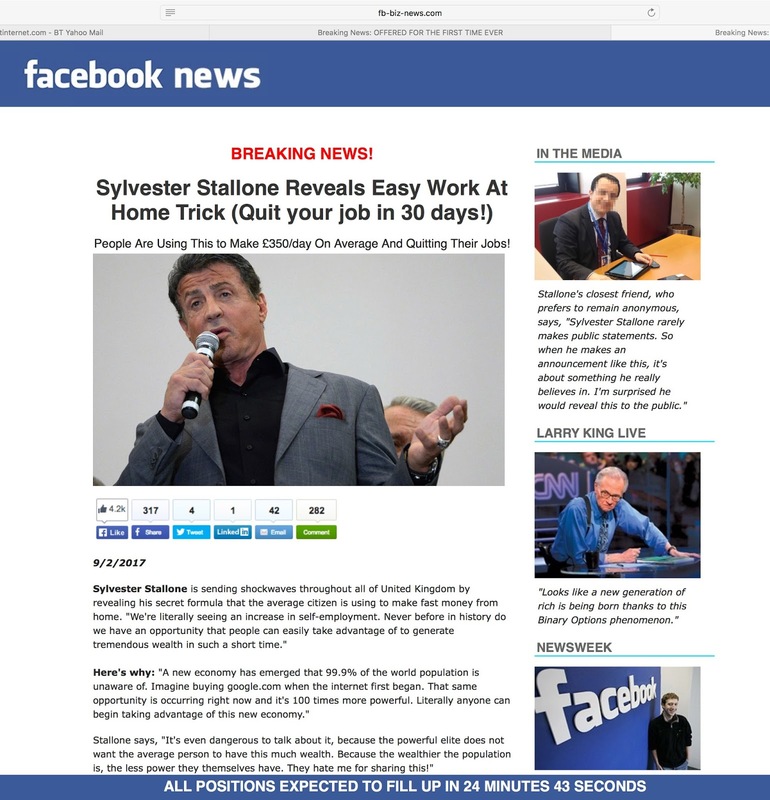 To be clear, I don't think any part of the internet should be carrying ads for this sort of fraud. Of course they shouldn't. But I can't help thinking that if a giant company like BT - who trade on a reputation of trust and respectability - are prepared to run ads of this nature then there's no hope of anyone else acting responsibly. It's like discovering your gran is dealing drugs. You know that people do it. But not her. Surely, not her! 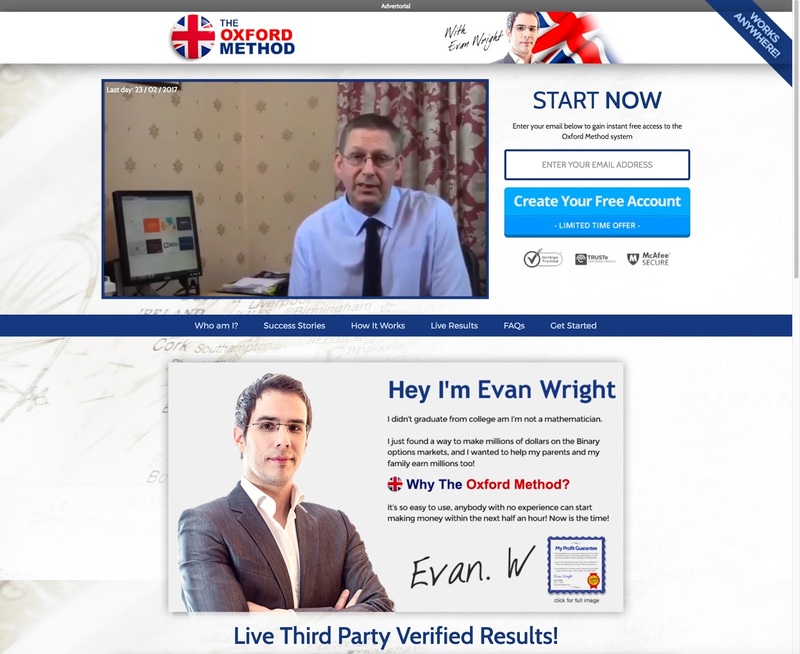 It was July last year when I first saw the ad for the Oxford Method. I can't remember whether it was before or after we'd taped the show with the Brit Method content, but I know it was at a stage when it was too late to go messing around with the material and adding in more details. I knew what the Oxford Method was because of the research I'd been doing for the show - and it may be that the research I had been doing was one of the reasons the ad popped up on my inbox, but even so... if they're serving me the ad, they're serving it to other people too... and they shouldn't be. It seemed obvious to me that BT weren't aware that this ad was on their network. The ads were probably bought and sold without much human interaction or oversight. I figured that once they discovered the ad was there, they'd remove it immediately. So I sent an email to BT letting them know it was there. That was on July 4th. I sent it to the email address that shows up online if you search for the CEO of BT, Gavin Patterson because, in my experience, emailing a CEO is a pretty good way of accessing the highest level of technical support. I don't know if Gavin actually reads the emails that arrive at that address or not... but I'm pretty sure there's a team of people employed to respond to them that are more empowered than the regular staff on a regular helpline. So I emailed Gavin explaining my concerns. And I thought the ads would disappear overnight. Only on July 5th they were still there. And on July 6th too. They did get back to me. On July 6th I spoke on the phone with someone called Michael Todd. He's an Executive Level Technical Complaints man, apparently. He was very polite and seemed genuinely concerned that the ads had been there. I don't remember the details of the call - because I wasn't expecting the thing to drag on and become this sort of a tale - but I'm pretty sure he explained that the ads weren't solicited, were sold via some kind of online auction process. More importantly, I got the impression that they'd now been dealt with. And then, on the 7th July, I saw another ad for The Oxford Method. The wording has changed. But even so. If the Executive Level Technical Complaints people aren't capable of blocking ads for a given name, something has to be amiss. If it takes them three days to try - and still they fail - then that's three days in which I think they can - and should - be held responsible for the ads. If the people behind the ad are changing the wording in order to get around the block, doesn't that suggest that the ad is worth their while? And doesn't that suggest that a BT customer or two have fallen for it? Of course, I can't prove that someone fell for it, but I can't see why the scammers would persist if it wasn't a fruitful route for them, so it's surely a strong possibility. And that seems like an awful thing to have on one's conscience. Anyway. It was a busy time and I thought little more about it. I happily assumed that BT had got to grips with the issue. And for all I know they had. 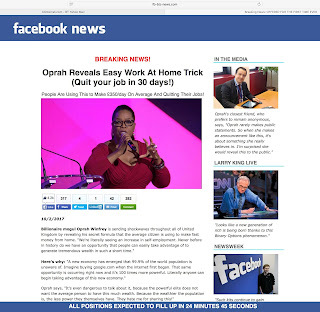 I was at home a lot more and so I had little or no need for webmail and so I wasn't seeing the space where the ads appear. But then, on February 1st - nearly 7 months after our first exchange of dialogue on the subject - I saw another dodgy ad at the top of my BT mail. This time it wasn't for The Oxford Method. It was for The Brit Method. So I emailed Gavin again. And again, Michael Todd was the man to reply. On February 3rd he explained that the scammers had got through by changing the name of the con. Which makes sense from one point of view. But is also basically admitting that the system is very easily abused that they're powerless to prevent it. In which case, I wonder if the system is fit for purpose? We exchanged a couple of emails and on February 8th (Wednesday) Michael wrote telling me that he'd get back to me by the end of the week. Yes, those words could be used in a legitimate ad... but how often are they? And wouldn't having oversight of just those ads at least be possible? 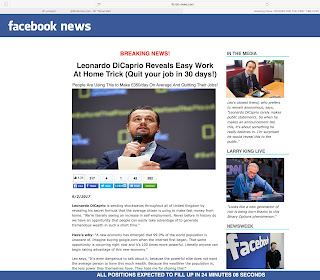 Which landed on this page of obviously fake newsiness about "secret money systems" and of-its-time references to the "political elite getting nervous about this secret getting out". Which tells you all you need to know about who this ad is aimed at. It's the already-feeling-beaten-up-by-life folks they're trying to seduce. It's the already-shafted who might end up getting shafted further. ... so that's DiCaprio, Dwight, Stallone, Winfrey and Hewson all dragged into this. It seems it's not just businessmen from popular culture... anyone from pop culture is up for grabs. All these pages are essentially the same - if you click on the pictures they should enlarge enough to make the text legible. He seems to be the closest friend of all five of these hugely famous showbiz legends. It's quite a feat for someone to be quite so well connected! 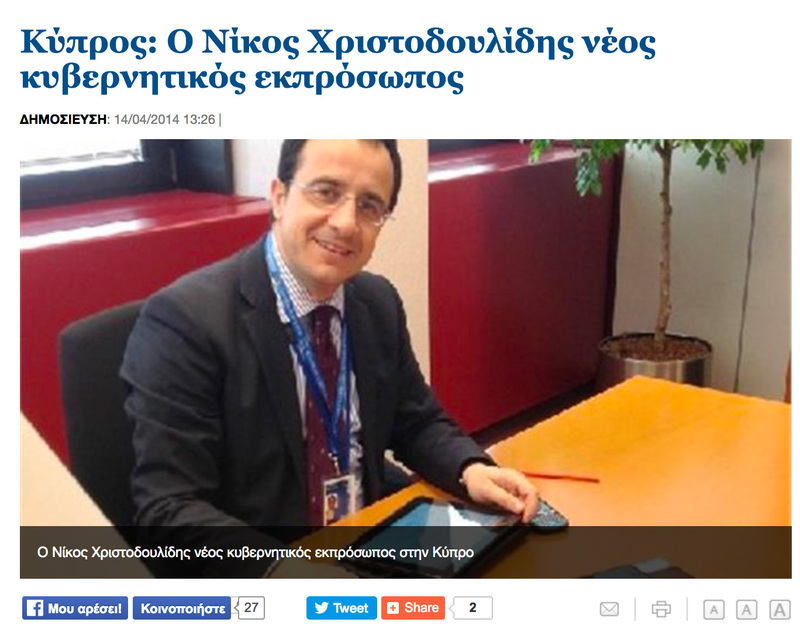 You think he'd have enough on his plate dealing with Cypriot politics without finding time to hobnob with the stars. Hmmm... maybe he isn't their closest friend after all. Maybe some crooks have just stolen his photo online and stuck it in their fake facebook page to make it look a bit more real somehow. I've exchanged plenty of emails with BT about these ads which continued to appear on my email for a good few days. I can't think of a good reason why an ad pointing to fb dash biz dash news dot com should be appearing on BT's network a day after BT know about the problem.. let alone two or three days after. But they were. 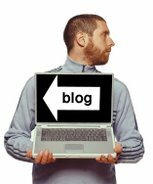 I asked Mr. Todd (Executive Level Technical Complaints, BT) if it was okay for me to quote our email exchange in this blog and he replied to say that it wasn't and that the information he'd given me was for my private use only. Although I'm not sure if I'm really allowed to tell you that as it was a part of the email exchange that I now know was for my eyes only. But then it's not as if I have much information from him that I could not divine from the situation. 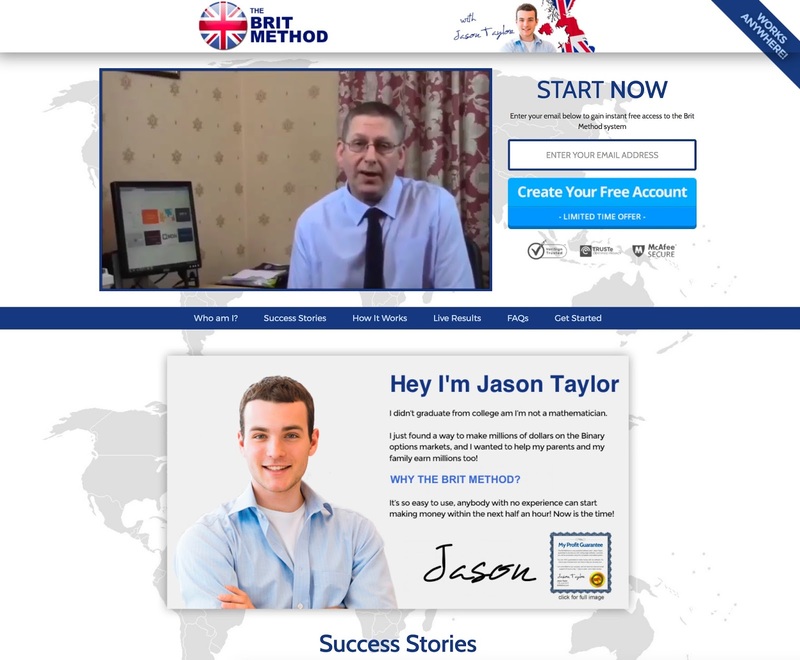 It turns out - I believe - that the Oxford Method/Brit Method ads were all from one advertiser and that they have now been blocked. Which rather begs the question: why didn't they block them in July last year... why were they still allowed to be posting adverts seven months after they were first discovered. Really the only information I have is that a lot of these ads have been getting through. And days after BT acknowledges them - and sometimes, days after BT tells me they've dealt with them - they still get through. I know that nobody vets the ads before they go into the system... but I find it utterly bamboozling that everyone accepts this as the status quo. The advertising world has made a technological leap that streamlines the process and reduces the cost and that is just how it is. But the consequence of it appears to be that there is little anyone can do to prevent it from being abused by people who are trying to con the vulnerable. And that's a consequence that ought to make everyone involved a little uncomfortable.Isn't it? And you can't have it both ways. BT makes in excess of 2 billion pounds a year. Either the ads are profitable enough to afford human oversight. Or they're not profitable enough to bother with at all. Maybe they'd say that this new system allows for huge numbers of advertisers to push ads to fewer people? And maybe that makes human oversight impossible because of the sheer numbers of ads involved? In which case, don't accept the status quo. It means the system doesn't work. Implement a system where new advertisers have to go through some vetting that established advertisers don't have to endure. But make it a privilege that can be revoked. I don't understand the world in which a corporate giant just shrugs its corporate shoulders and accepts that they'll occasionally be used to advertise fraud. "to promote and protect advertising in the UK by creating and maintaining a climate of responsibility amongst advertising practitioners, encouraging moderation from regulators and building trust with consumers"
I suppose there's something broader at work here - something that is an internet-wide problem. Sites like Twitter, Facebook, Youtube and Flickr etc would be unable to function if they had to take legal responsibility for every tweet, post, video and photo that was uploaded to their site. 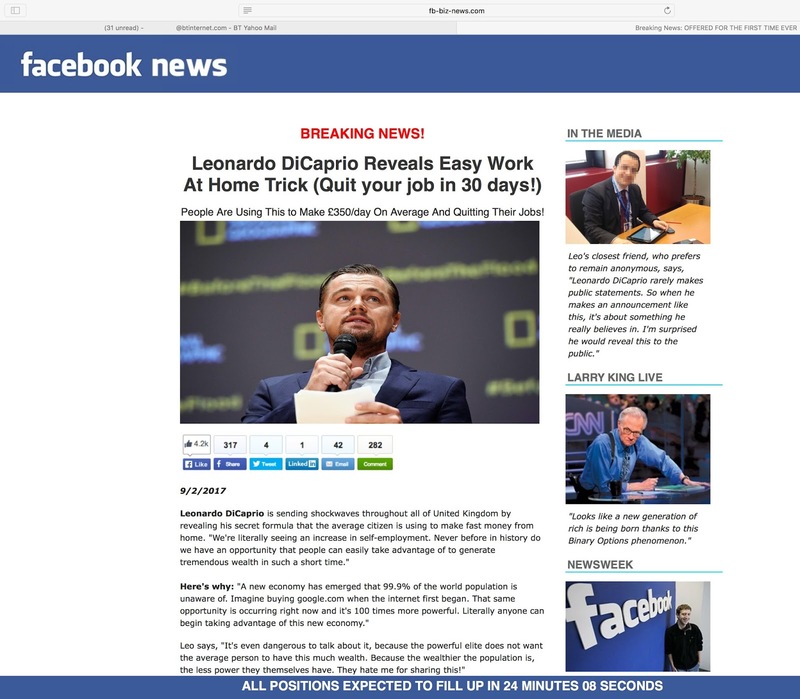 It's not possible to check every bit of content before it's published. And so, by analogy, maybe we have to accept that in this democratised, online world of ours, companies like BT and Yahoo just can't be held legally responsible for the ads they carry because they work in the same way. But there is a counterweight to that situation - and that's a responsibility to remove inappropriate content in a timely fashion the moment they are aware of it. 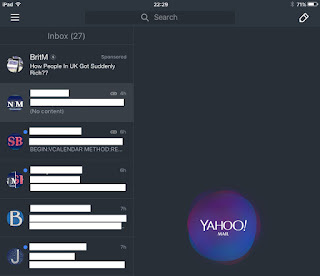 I might be wrong, but I can't see anywhere on the BT/Yahoo mail page that acknowledges there's even a possibility that fraudulent ads might appear there or that explains a quick and easy way to report one. And my experience demonstrates that they're simply not able to act quickly enough when they are aware. Ads like these simply shouldn't still be in the system days after a company knows about them. I know this is an extremely long post. And I don't know what I hope to achieve by it... but I can't help thinking that the idea that online-fraud is just one of those things we have to accept is just bizarre. And if a company with the clout of BT is unable to deal with it properly... then who the hell can? PS: a couple of days after I emailed Michael Todd and asked if I could quote our email chain on my blog I was contacted by someone called Charles Stewart who works for Yahoo PR in the States. He asked if we could have an off-the-record chat about it all. I wrote back explaining that I'd love to chat but that I didn't want to make it off-the-record. It seems to me that what's needed is more transparency here, not less... That was six days ago. He hasn't got back to me yet. 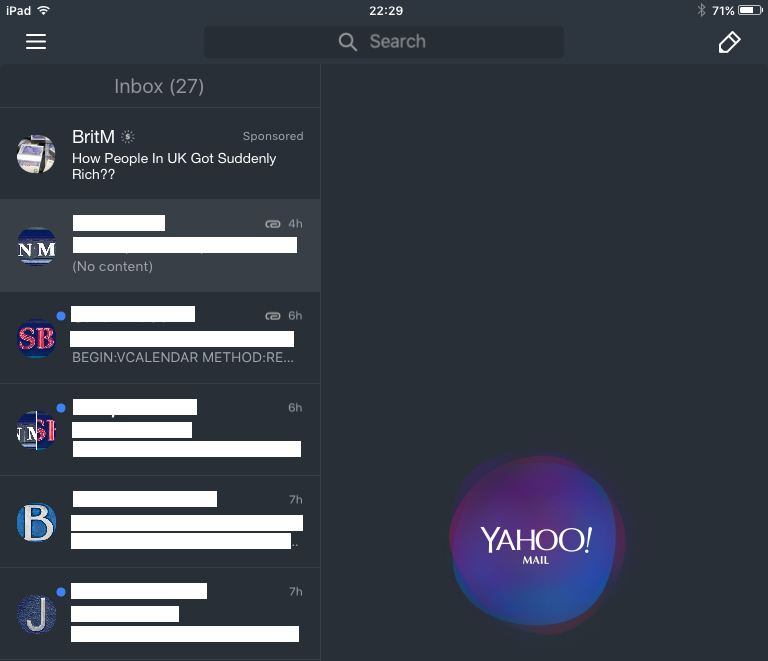 It's only fair to point out that in those past six days I haven't seen a dodgy ad on my BT/Yahoo webmail page. ... which is an ad for - drum roll please - The Brit Method. The website it takes you to isn't some new URL that could have easily slipped past their radars... it's Brit dash Method dot com. Which, by my reckoning, means one of two things. 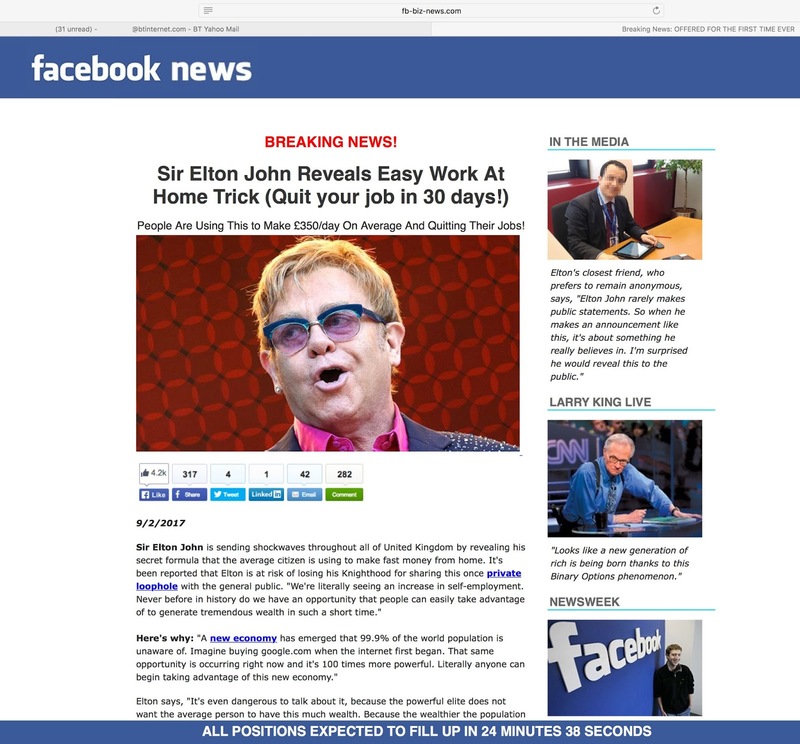 2: Yahoo and BT are aware of this issue, have successfully stopped these ads from appearing on their shared webmail page, but are happy to allow ads they know are fraudulent to appear elsewhere. Hello there. I hope this finds you well... I'm writing this from a new production office where I'm currently sitting around, trying to remember how we make Modern Life Is Goodish. You'd think that after four series and 28 episodes I'd be able to remember something of the process... and yet, every time we start again I find myself cowed by the sheer scale of the task ahead. I'm sure we'll muddle through. Still, there's a table-tennis table down stairs, so that's a good start. That's not the only good news. 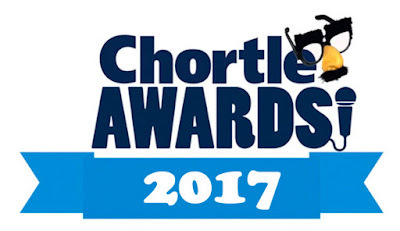 It seems the series has been nominated for a Chortle award. That's nice. It's one of those where people vote online. What's the correct way of handling this? Not mentioning it seems a bit wilfully aloof. Begging your indulgence feels a bit needy. It is what it is. Do what you do. Let us never talk of this again. More tangible is the news that some of the warm up shows for series 5 have been scheduled. It would be lovely to wait until they were all organised and to then tell you in one, complete post... but they are more spread out than in previous years so that won't work. So far there are shows in both Andover and Aldershot in May, in Cambridge in July and in Reading in November. The details for all of those are on the Live Dates page of my site. There will be another set in September and there'll be a new season of Screen Guild shows being announced soon too.